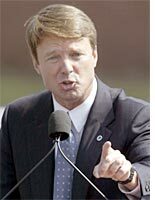 John Edwards: Not Ready for Prime Time. There are other emerging fissures, as well. The aggressively photogenic John Edwards was cruising along, detailing his litany of liberal causes last week until, during question time, he invoked the “I” word — Israel. Perhaps the greatest short-term threat to world peace, Edwards remarked, was the possibility that Israel would bomb Iran’s nuclear facilities. As a chill descended on the gathering, the Edwards event was brought to a polite close. Evidently the Breck Girl has never heard of al Qaeda, Kim Jong Il, or Mahmoud Ahamdinejad.